Since 1977, Track Shack and Track Shack Events have produced numerous events to benefit charities throughout the greater Central Florida community, primarily serving Orange, Osceola, Lake, Seminole, Brevard, and Volusia counties. The two sister companies have also sponsored athletic events in area schools and have made donations to athletic programs in schools from elementary through college level. It has always been important for Jon and Betsy Hughes, co-owners of Track Shack and Track Shack Events, that both businesses support charitable causes, in particular charities that benefit youth and youth athletics. This tradition continues through the creation of Track Shack Youth Foundation, Inc. in 1994. The Foundation was established as a 501 (c) (3) non profit organization with the purpose of promoting and encouraging health and fitness with an emphasis on youth programs. To date since its inception, the foundation has contributed over two million dollars to community programs. Now, more than ever, youths in our communities are battling serious challenges. It is our feeling that sports and organized athletic programs offer children structure and goals, which are vital to mental and physical development. Unfortunately, many schools have to cut back or even eliminate sports/athletic programs due to lack of funding. 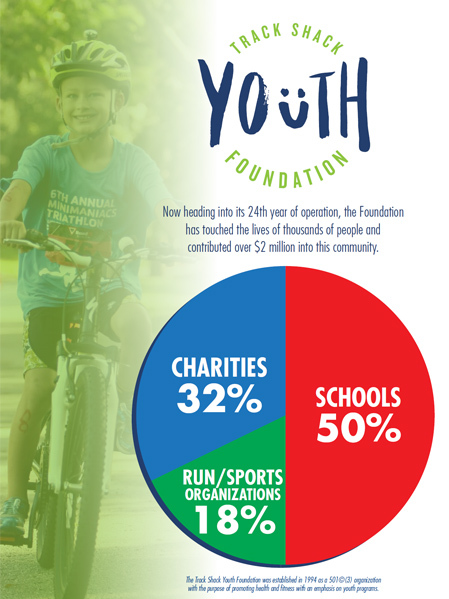 It is our intention that through financial support of youth athletic programs throughout the community, we will help sustain these important programs for children. Programs that build self-esteem and confidence, foster healthy and wholesome habits, and develop leadership and cooperation skills.